Subsequently, the oath of obedience changed into an oath of fealty, and therewith the system of entourage into the genuine feudal system. Not all the retainers could live at the court, so they were given a piece of land as beneficium (French fief), and they were only called into service on special occassions. The dependence of the vassals towards their lord was lessened, at the same time the social status of the vasalls developed into membership of a special group with increasingly high standing that would become the knights. A disadvantage of this development resulted in the king and the lords somewhat losing the grip on their vasalls. During the reign of Charlemagne, feudality developed into a veritable system by uniting the originally independent institutions of the personal bound by commendation and the landloan of the beneficium. Vassalage thus became the prerequisite for receiving a beneficium. The act of making a vasall was formalized: the first step was the commendation or manumission ('handgang' - the vasall put his hands into the hands of the lord), followed by an oath of fealty. Touching of a reliquar was also often part of it. The importance of the oath was enhanced the moment the institution of the antrustiones went into decline. A possible reason for this was the fact that the oath was legally binding for both parties and it could only take part between freeborn men. It thus gave a counterweight to the act of the commendation that stressed the dependant situation of the vasall. Successively, vassalage became acceptable even for persons of high standing. Obedience was no longer neccesarily included in the oath formula. "By this oath I promise to be faithful to my lord, the very pious Emperor Charles, as according to custom and right a vasall owns faith towards his lord, to guard his realm and protect his rights. And I will keep this my sworn oath henceforth as is in my power, and may God, Creator of heaven and earth, and these holy relics help me." (1) Often the oath of fealty is defined in a 'negative' way: not to do anything that may give harm or disadvantage to the lord, "...to ensure the king by an oath of fidelity not to do anything against his life and his body, and not to take him prisoner to his disadvantage..." (2) The lord, too, had duties towards his vasalls, besides fidelity from his side it was mostly protection in form of military aid in case the vasall was attacked, and maintenance, fe. by giving him a beneficium. In addition to the afore mentioned fidelty, the vasall owed his lord consilium et auxilium, ie. he had to visit his lord on days of council and judgement and function as an advisor. Auxilium meant military aid as a mounted knight, together with his retainers, if he had; but it also could involve payment of ransom, or giving financial support in case of great celebrations such as marriage. High standing vasalls of a king could be asked to bring 500 or 1000 warriors to a war, part of them fully equipped kinghts. Therefore, vassalty was mostly a military institution. Commendation and oath-taking both founded the personal relationship between vasall and lord, and a contract made in that way could not be broken or annulated save by the death of one of the parties. Later on, failure of one of the parties to keep the mutual promise of succour by the vasall and protection by the lord could also lead to annulation of the feudal bond. We have to keep in mind that personal bonds were the only way to somewhat regulate the misuse of power in a society without a 'modern' political system of legislative and courts of justice. Added to this, religion in Mediaeval society had a very strong influence and oath-breaking was considered as a major sacrilege leading directly towards condamnation. 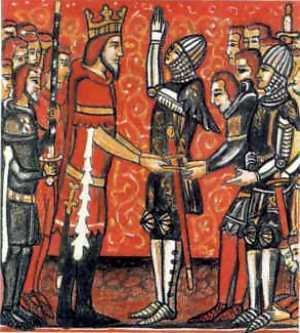 Third part of the ceremony of making a vasall was the so-called investiture: the vasall was given the right over his beneficium by handing over of a symbolic object, fe. a staff. The sequence and importance ot the three elements of commendation, oath, and investiture changed within time. Originally, the beneficium fell back to the lord after the vasall died. But the heirs of a vasall were, of course, interested in keeping the fief. Often the lord agreed to this and the usual way was to reenact the whole ceremony to make the new bond legal. In the second half of the 9th century heritage became the accepted way of transferring a fief. The feudal pyramid - that means the system of lesser lords bound to dukes and counts, and these bound to the king - was weakened by the fact that an increasing number of minor vasalls and subsequently even the higher ones gave their alliance to several lords for different fiefs. This resulted in a lessened bond towards the king, the oath-taking became a mere formality. At the end of the millenium the feudal system was close to a collapse, a development accelerated by the weakening of the position of the king during the late Carolingian period (there were often several sons fighting over the heritage and the lands). But still the value of the oath had some effect and kept the feudal system and with it the empire from collapsing. "Because it is well known to everyone that I have no food and no clothes, I have prayed to your compassion and I have of my free will decided to give myself into your protection, or to commend myself to you. And I have done this; it shall be that way that you will give me food and clothes and support me in the measure as I will serve you and therewith earn your support. Until my death I am obliged to serve you and to obey you as I may as a freeborn man, and during my life I cannot withdraw from your power and protection, but I will remain in your power and protection as long as I live." (1) This formula is a rare written example for a process which usually was staged orally and by the use of symbolic gestures. The contract of commendation was concluded between two persons and ended with the death of one of the parties. It is important to note that the duties of the commendent might not interfere with his rights and dignity as a freeborn man. Pacts between free men of lower social status and men of power have already existed in Merovingian times, and I suppose they may have existed even earlier albeit there's no proof. Roman sources did not care how exactly the relationship between fe. Arminius and his retainers, if he had such, was defined. Those pacts were based upon service from the one side, and protection from the other side, the patrocinium. The relation between them was hierarchical, power on one side, obedience on the other. Especially kings could thus attract men, and in Merovingian times these royal retainers were called antrustiones. They formed a special sort of personal guard with a number of privileges. For example, if any of them was killed in a fight, his relatives got a higher weregild than for a non-member (2). This special status the group had in common with the Old Norse hirð, only the latter organisation lasted until the 13th century. The Merovingian antrustiones fell into decline when the Carolingian familiy rose to kingship in the 8th century. (1) Taken from the Formulae Turonensis, No. 43. Edition: MG Formulae Merovingici et Karolini Aevi. ed. by K. Zeumer, p. 158. The formula dates from the beginning of the 8th century, but the form of it goes back to an old tradition (Ganshof, p. 4). (2) It is not clear whether the members of the antrustiones were connected in a form of co-operative among each other (as it was the case in the hirð), or whether they as vassals of the king only were bound to him; Althoff, p. 139. (3) Ganshof, p. 7. An example for the act in: De regis antrustione, in: Marciulfi Formulae 1.18, ed. Zeumer). (4) The word beneficium is often used in the chartes and documents from the Merovingian times onward (Ganshof, p. 9). (5) The word vasall (Latin vassus or vassallus) is used from the 8th century onwards. It might go back to the Celtic gwas = servant (Schulze, p. 58), but there is no absolute proof for this assumption. consite gramineas amnis viridissime ripas! ut fluvius, vitreoque lacus imitate profundo. Thus says the poet Decimus Magnus Ausonius (310-395 AD) in his Mosella. Ausonius was born in Bordeaux (Burdigala, Gaul); poet, wine-lover, teacher of the young emperor-to-be Gratian, and obviously a bit of a traveller since his poem Mosella describes a journey along the river. A complete Latin version can be found here. Framed by grass; river of greenest shores. Along the stream, and a glittering lake your depths emulate. I wish I had known the text when I traveled there. The images Ausonius evokes respond to what I did experience on my Moselle cruise in the evening. Hesperus et viridi perfudit monte Mosellam. Brings shadows of night, and green mountains fill the Moselle. The distant vine and grapes swell in crystal waves. As he lets his boat drift by on the surface. With hills and shadows, lines blur in the water.